Cypriot power metal band Arrayan Path continues a consistent output of albums with their new and sixth album, Dawn Of Aquarius. Like many of their previous albums, this one also has a theme. More specifically it revolves around a single entity, the Hindu goddess Kali. As vocalist Nicholas Leptos explains: "This album is 13 mantras honoring mother goddess Kali and explores all aspects of Hindu history and mythology in regards to the black Madonna, Kali." My only recollection of Kali comes from Indiana Jones and The Temple Of Doom, where she was receiving blood sacrifices as the goddess of the underworld. (As I also recall that representation pissed off a host of Indian people at the time.) Without the lyrics in hand, I'm not sure how the legendary Hindu goddess is portrayed by Arrayan Path. 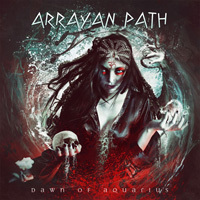 Nevertheless, with Dawn Of Aquarius you find Arrayan Path holding firm to their melodic, sometimes progressive, power metal. And there's a lot of it two: 13 songs over 63 minutes. Essentially, the album is packed with large, bombastic, and epic power metal songs. There's walls of riffage from harmonious twin guitars. These in turn are embellished by a lavish synth layer that adds accent, color, and orchestration. These two things are emboldened by a booming rhythm section, where the bass and drums fortify each song with strength and gusto. Above this Leptos vocals rise and soar, yet are largely hard to understand. You'll need that missing lyric sheet. Essentially then, and musically speaking, those characteristics define most every song here. Yet some songs deserve some mention. One is the opening number that begins with South Asian guitar work before bursting into power metal. Another is Cremation Grounds, which begins with epic riffage and synth orchestration, followed by more Indian flavor in the form of a sitar, at least I hope it is. Later it pumps up again into charging power metal. Another song with an epic feeling is The Hundred Names of Kali Ma, thanks again to the riffage and synth combination, but also the large chanting vocal arrangement. Finally, with Guardian Angel you have something of a lighter song. It begins largely with voice over acoustic guitar, yet seasoned with sharper electric riffs. These give way to a heavier, bombastic center, with raging riffage and more intense vocals, before exiting as it started, light and mellow. 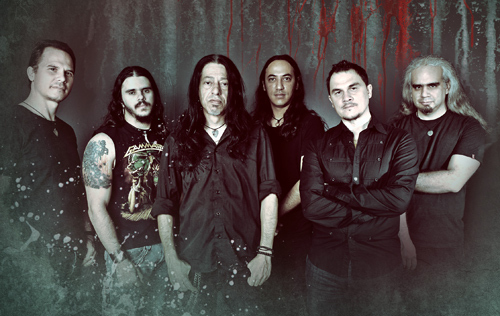 Essentially, Dawn Of Aquarius finds Cypriot metal band Arrayan Path at their best, delivering epic and bombastic power metal. If that's what you dig, then you will love this album. Recommended.